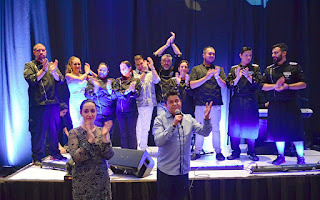 With this spectacular ending the Vallarta Nayarit Gastronomica reasserted its relevancy, and both the Riviera Nayarit and Puerto Vallarta reaffirmed their positioning as culinary destinations bar none. 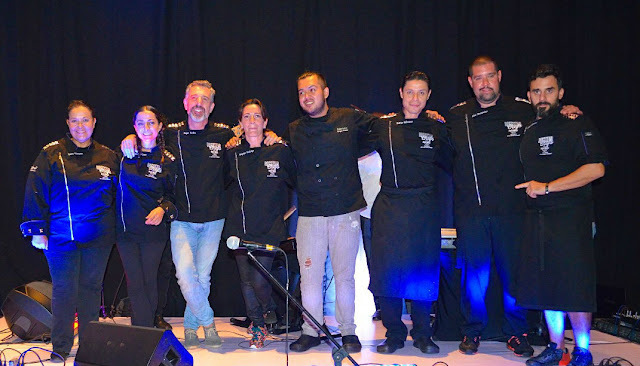 The magic of Michelin-starred chefs plus the top iconic Mexican chefs paired with Premium brands—driven by unique style of the Riviera Nayarit’s Hard Rock Hotel—all came together for one unforgettable night on October 31, 2017 during the 9th Vallarta Nayarit Gastronomica. 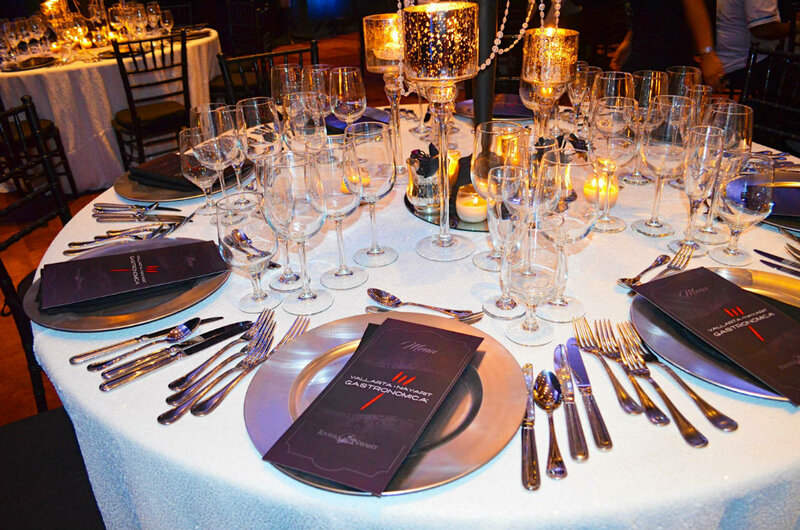 The “Rock Star Chefs” dinner was every bit as spectacular as expected—and more—with the participation of eight chefs and two sommeliers that showed off their culinary talent and shared flavors from around the world. About 100 people had the opportunity to share a spectacular dinner specially prepared by the top proponents in the global culinary arena. Eight exquisite courses were served in a gorgeous vintage black and white setting that was tailor-made for the occasion, featuring sequined tablecloths, candleholder centerpieces with feather accents and elegant black orchids. 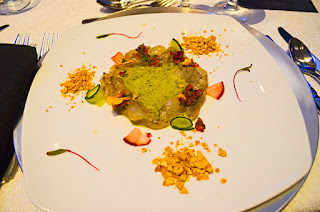 The feast began with a course prepared by Rodrigo Ballesteros, the Host Chef from the Hard Rock Hotel, who prepared Pulpo Tatemado Taxtihuil, a traditional octopus recipe in Nayarit, paired with an L.A. Cetto Sierra Blanc Sauvignon Blanc. Betty Vazquez, the Riviera Nayarit’s Culinary Ambassador and a judge on Master Chef Mexico, offered her traditional Aguachile de Camarón “San Blas,” a shrimp dish paired with a sparkling white Cava Castell from Ribes, Spain. Begoña Rodrigo, winner of Spain’s Top Chef competition who helms La Salita and Valencia’s Nómada restaurants, created the third course: an Ensalada de Encurtidos y Salazones, a salad of mixed pickled and salted delicacies, paired with a white Tobia Reserva Viura/Malvasia from La Rioja region. Chef Abel Hernandez of Mexico City’s Eloise y Loretta restaurant served a delicious Risotto Escargots with foie gras Rougié kisses, paired with an Alma de Tobia FB rosé from La Rioja, Spain. Pepe Solla, the chef from Casa Solla restaurant in Galicia, Spain who sports one Michelin star, presented a sea bass with a root vegetable puree, salad and ajada (garlic sauce), paired with a white L.A. Cetto Boutique. Meanwhile, Chef Estanis Carenzo, awarded two Soles Repsol from Sudesta restaurant and Casa Bonay in Madrid and Barcelona, offered diners a lamb in consommé with butter and chile, a strong, savory dish that could only be paired with a red L.A. Cetto Don Luis Terra. The much-anticipated desserts began with Mexican Chef Lula Martin del Campo from Cascabel restaurant in Mexico City, who served a brownie with a spicy mole oaxaqueño sauce, an explosion of flavor that was perfectly paired with an Oscar Tobia Selección red from La Rioja, Spain. The final delicacy was charged to Chef Darren Walsh from Guadalajara’s Curanto and Lula Bistro, who served a Dulce Amargor, a bittersweet treat, paired with an L.A. Cetto Moscatel y Palomino. The digestifs were from XA Casa Sauza and XO Hennessy, and Pilar Mere and Yamir Pelegrino were the sommeliers in charge.